Bow, Nutta Mahattana, who covers all the protests live on Facebook. Rangsiman Rome, leader of Democracy Restoration Group. Netiwit Chotiphatphaisal, former Student Council President of Chulalongkorn University. Ekachai Hongkangwan, who served almost three years in jail for selling copies of an Australian documentary about the Thai monarchy in 2011; upon his release, he founded a nonprofit to help lese majesty victims. Arnon Nampa, a human rights lawyer who has been assisting with many cases against political prisoners. And Sukrid Peansuwan, who is new to activism. These seven have been charged with sedition for leading a rally on Saturday, January 27, on the Skywalk at Pathumwan Intersection, protesting the continued deferment of elections and the stalled investigation into the many expensive undeclared watches of Deputy Prime Minister Prawit Wongsuwan, the second-highest junta leader. The charge of sedition against activists asking for elections and protesting corruption is absurd, but we are forced to take it seriously because this Orwellian military dictatorship regularly ruins lives with ludicrous rules and rulings. The Thai dictators actively target anyone brave and principled enough to stand up for their own rights and the rights of others. And Chanoknan Ruamsap (nickname “Cartoon”), a prominent female activist, who two weeks ago woke up to learn she had been charged with exactly the same “crime” as Pai---over a year after she shared that same mainstream news article! Within hours she had fled the country, leaving behind everyone she knows and loves. In bringing sedition charges against seven of Thailand’s most-respected activists, the junta government is escalating its abuse of power to eliminate dissent. One is reminded of the frivolous charges brought against 13 activists jailed prior to the October 14, 1973 popular uprising during which they were charged with assembling in groups larger than five. The National Council for Peace and Order is running out of excuses for its very long “temporary” suspension of elections and human rights guarantees. It is not only the Skywalk activists who are tired of their excuses. An alliance of 24 grassroots civic and human rights organizations is conducting a signature drive to petition for the repeal of 35 oppressive orders, including the 4-person limit on freedom of assembly. And there is a We Walk campaign, a cross-country march to publicize issues of state welfare, universal healthcare, food security, community rights and environment protection, and political rights and democracy. Along the way, marchers have been blocked by police, have had to break into groups of four, and leaders have been harassed with legal summons. Thai people have a right to elections and democracy (Article 21 of the Universal Declaration of Human Rights). Thai people have a right to peacefully assemble in groups larger than 4 for political purposes (Article 20). Thai people have a right to speak freely, and Thais have a right to the uncensored news (Article 19). Not only are these human rights attached to a person by birth, Thailand was an original signer of the Universal Declaration listing these rights, and the current junta-written constitution pretends to guarantee these rights. And, as a practical matter, these rights must be respected if Thailand is ever to escape from its current predicament and attain the highest levels of social and economic prosperity. Specifically, if the Thai people are not allowed to gather in groups larger than four without harassment, they will not be able to form political parties. If they can’t criticize their leaders without being charged with sedition, they can’t campaign. Thus Dictator Prayuth and his gang members will win the next election, having prevented all rivals from organizing; the Thai people will be unable to represent interests through the government process; and, with no accountability in government, officials will continue to bully, abuse, cheat, and steal from the Thai people. Because they broadcast their demonstrations live on social media, everyone can clearly see, and no one can deny that Sirawit Seritiwat, Bow Nutta Mahattana, Rangsiman Rome, Netiwit Chotiphatphaisal, Ekachai Hongkangwan, Arnon Nampa, Sukrid Peansuwan are peaceful civil rights activists, no different than Rosa Parks and Martin Luther King. They use the same tactics to call for equal rights and democracy. 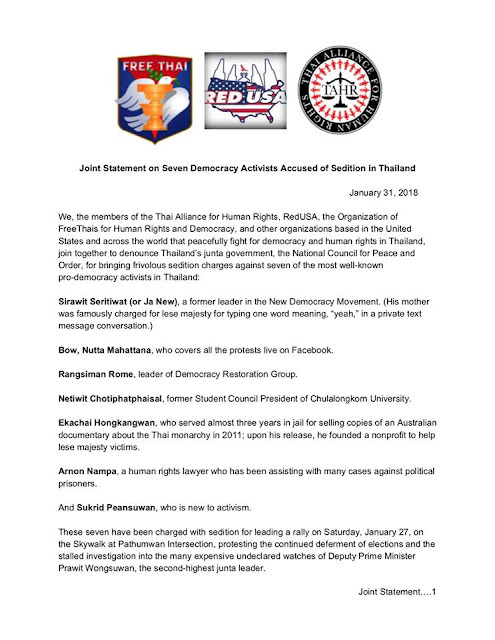 These seven leading Thai activists have persevered in their struggle despite constant harassment, including warrantless arrests, temporary enforced disappearances, and frivolous lawsuits brought against them for exercising their rights to free speech and freedom of assembly. Freedom of speech must mean the freedom to say things that someone might not want to hear. Freedom of assembly must mean the freedom to organize for purposes the government is not completely comfortable with. Otherwise these freedoms mean nothing. We express our solidarity with the seven activists and with all those in Thailand who campaign for a return to democracy. The junta must stop bullying peaceful protesters and respect all the rights outlined above.